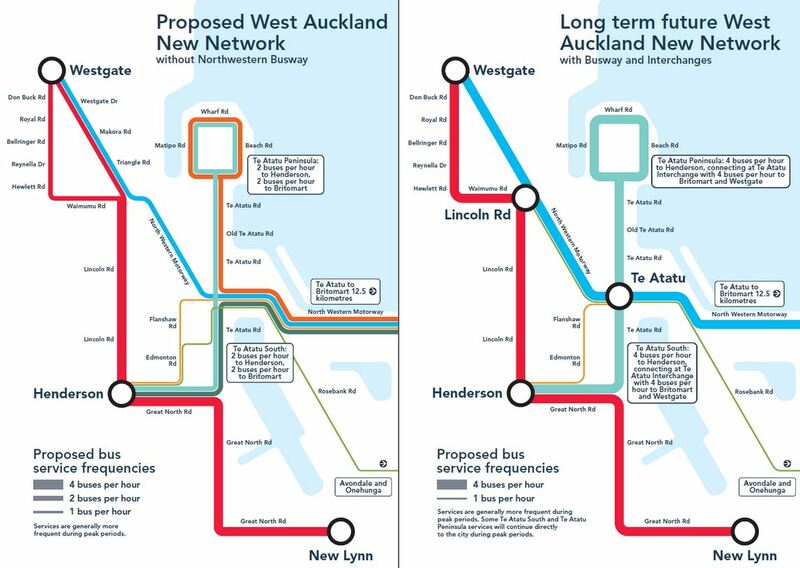 On Sunday the next major step in the roll-out of the new bus network takes place, this time in West Auckland – and a few services that also serve the isthmus too. As AT said in a recent press release over it, everything is changing, this includes new bus routes, new route numbers and new timetables. The change also some new operators and a lot of new buses. 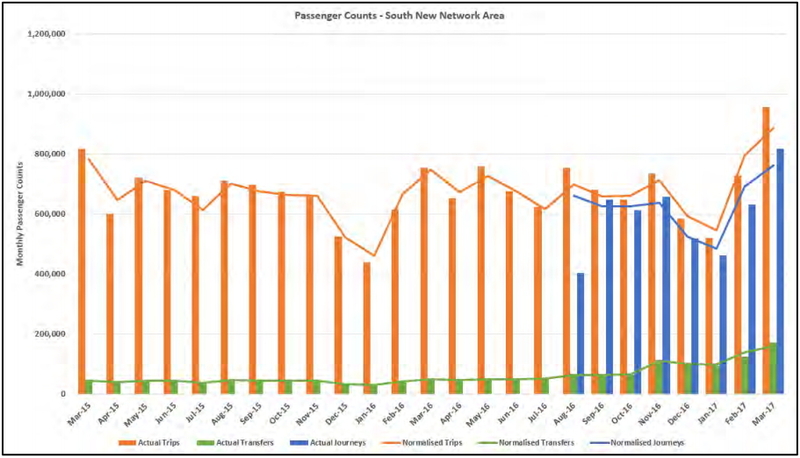 I think the biggest disappointment, and it is the same with the new South Auckland network launched last year, is that train frequencies aren’t being improved. That means we’re stuck with half hourly trains on weekends and not much better during off-peak periods on weekdays when services should be running a minimum of every 15 minutes. It’s also disappointing that AT haven’t made any progress on building interchange stations at the Te Atatu and Lincoln Rd interchanges to a frequent service along SH16 and an even simpler network structure. As mentioned the changes on Sunday also affect some other isthmus services too. In this case, buses on New North and Sandringham roads where AT say there will be buses leaving the city centre at least every 15 minutes until midnight. It’s also worth noting, and we’ve mentioned in a few blog posts, that so far the new network in South Auckland is doing well. Good luck with the change AT and if you do catch buses in west, let us know how the change over goes. We really need Bus/HOV lanes all the way between New Lynn and Waterview, buses are no longer reliable with plenty of bunching in the AM and PM peaks. This problem will be exacerbated with increased frequency on the No. 18 route. The new lane near Waterview on ramp coming soon will not suffice. Totally agree. Given the drivers seem incapable of actually running to a timetable, I am not holding my breath that buses through Avondale will actually be every six minutes as promised. The drivers seem to leave New Lynn early meaning that large numbers of buses start bunching as they get to the Avondale Shops. This morning, three buses came through in 3 minutes (including one that was ten minutes early). The next scheduled bus was 19 minutes later. Auckland Transport has to start making some hard decisions and implement bus or transit lanes to actually ensure that this promised service increase works. AT have a manual with the practical effect of ensuring that they can’t install bus lanes until they’re horribly congested. Until they throw out that manual and start planning a proper transport system the status quo will remain. An early bus is pretty much the equivalent of no bus at all, especially on less frequent routes. Ritchies in West seem to be the worst ones with early running but I have seen it with other operators too, even Go Bus in the South. +1. AT did all this traffic calming work in Avondale shops recently with raised tables for some ped crossings, but these will need to be ripped up again for the badly needed transit lanes (if they decide to do so). Also, the 195 is a shocker going down Blockhouse Bay Road in the peaks. I arrived at the stop this morning to discover that two buses had arrived early meaning it was an eleven minute wait for the next service, which compared to some of the terrible waits at that stop isn’t so bad, but not exactly the “turn up and go” promised. Two buses arrived at exactly the same time so the two buses played leapfrog the entire way into the city. Unsurprisingly one of them was almost empty. It highlighted how badly bus or T2/3 lanes are needed through Avondale and Waterview. It would also help if NZ Bus could actually train their drivers not to leave early. I’ve pretty much given on the Great North Road route to Midtown if I haven’t caught one before 7.15. What I now do is catch the train to Mt Eden, and transfer to a 258/267 towards Midtown. Much more reliable journey. While my elderly neighbours and I are looking forward to having bus services available on Sundays and Public Holidays we are dismayed at the fact that passengers transferring at Westgate to proceed towards Kumeu & Helensville will be expected to stand on the side of the road without bus shelters of any sort. This bus stop (1599) on Fernhill Drive looks very ad hoc and is now 2 blocks further away from the existing bus exchange and will involve many elderly PT users dragging their shopping even further without any shelter enroute to the roadside spot where there is nowhere to sit, place shopping or take shelter from the wind and rain. Across the road from stop 1599 are 3 shelters at stop 1592 which have sat there unused for years – Great that they will now be in use for those heading into the city, but what about those heading north? I guess we could sit in the shelters across the road and then play chicken with the traffic to get to the stop opposite. Myself and many others raised this issue with AT when they alerted us to the changes coming. We were promised a shelter but there is no sign of anything changing. I can only guess it is something to do with NZRPG continuing to treat public transport users as undesirable second class citizens they do not want cluttering up their glorified carpark. Greater Auckland really should do a post on the shenanigans that NZRPG have been up to with the council over public transport and council amenities at Westgate.. The refusal to remove a traffic island to allow bus movements onto Fred Taylor drive and thus adding 1 million extra KM’s onto bus mileage each year is but one example of their attitude. Yes I noticed those new stops seem way from the centre of the centre now, wondered why. Given there is also the newer NorthWest Shopping Ctr, will be a big 20 min walk from those stops! I mentioned it to a chap in an NZRPG vest the other day, he was checking out the lighting and awnings around the place. I suggested that NZRPG / Westgate could use the security guards trundling around in golf carts to transport the elderly, disabled and infirm to those remote stops as both a service and public relations exercise. He was sympathetic to what I was talking about and suggesting, but intimated that NZRPG don’t give a hoot. According to this March story on Radio NZ, NZRPG “called time” on the original bus shelters. Radio NZ have been doing excellent reporting on the whole debacle, sadly most of the residents out NW are unaware of what is and isn’t happening. Hmmm now all makes sense. There’s no consistency in operating hours at all. Planners just seem to do what suites them personally. Great example is the 110 compared with 132/133 and 134. Surely the Te Atatu buses deliver more patronage than Triangle Rd yet 110 gets a last service 30-40 min later and a niterider style service. Yes I realize Westgate is an interchange but there are no services to transfer to that late. Honestly just seems like one of the planners lives on triangle road or Westgate drive. Frequency, particularly in the evening leaves a lot to be desired, transferring will be a big issue, which means that previously direct trips (like to Royal Highs) will be even longer now. Good to see the night buses being changed to operate on the daytime routes. Now for extending the days of operation . . . Except for the places where they scrapped them completely – like Te Atatu Peninsula. No night buses there any more. AT could have ran 110 via the Peninsula at night, but chose to kill it completely 🙁 Now one can walk from Henderson. Indeed, I was looking forward to a better night service, but instead it’s been wiped out totally. Great work AT! Yeah and the fact that Te Atatu Peninsula and Royal Heights had the most people getting off the N05 niterider yet they choose to maintain triangle road only? When it was least used. In their email justification they blame low patronage yet remove the route from where any patronage is coming from… what a joke. I don’t live in Te Atatu but I would say a 132 or 134 niterider would deliver much more patronage than 110. Even the N05 would be preferable to the 110 imo. Will be interesting to see the patronage after a few months, I guess the consistent fairly late service helps a lot of people, but is pretty skeletal in coverage. If they wanted to economise it seems instead of extending the 18 to Henderson on the late nights, they could’ve just done the 14t later to connect with the 18 as it does during the day anyway, thereby covering Lincoln Rd at least. The 110 only duplicates the 18 at the city end then (as it travels on the motorway) meets the 14t at Triangle road anyway! Gives a speedier trip home is only advantage. I’d guess that will become a popular service quite quickly. Yes this is probably the biggest improvement of the whole Western NN? Existing timetable is so horrible in that area, all over the place & hard to understand. Looks like someone has been throwing spaghetti at a map again. I thought we were trying to stop doing that? With the 120, it again doesn’t start early enough when going to Henderson. The earliest arriving there at 6:40am. Also, Don Buck Road won’t have a service after 11pm from Henderson. The last services should have gone to Hobsonville too. There is a number of oddities like that – in my area – the first 131 (Te Atatu Pen -> Henderson) is at 6.25am, arriving at Henderson at 6.50am – far too late. On the way back the high frequency is between 2pm and 4pm, going back to 30 minutes after that. Apparently for high school kids (that used to have a single 082, that was never more then 20% full). Generally, past 7.30pm TAT goes back to 1h frequencies (as it was before), so not great either. The current 049 last leaves henderson for the peninsula is 10:40pm. So they thought they would take that back an hour too. Is there a way to provide AT with feedback in a constructive manner? There’s been lots of information sessions over the last few weeks, but I can’t find any specific contact point for NN issues after it goes live. Overall I think the NN is a big step forward. However, there’s some issues in my area that have become pretty obvious only once I go to actually plan journeys; stuff in the timetabling that can and should be fixed in this in the next version. Did a PT trip with some of the family on Sunday to try things out and partly because taking the kids only 99c a journey. Everything worked pretty well. Went to Hobsonville using Penrose train station as a starting point (cheating I know, but often do this on Sundays until new network rolled out in central area as getting back home is to inflexible on a Sunday). Used Google to plan things, wanted to catch buses out there then train back as much less tiring way to finish, but plan was reversed after the 008 we were going to catch was displaying a 009 so didn’t wave it down. Fate would have it that a southern train was delayed due a train fault so we had time to change plans and catch the train via Newmarket to Henderson, then catch the much more consistent 120 that heads to Constellation. On way back home, it suggested going via Constellation & NEX, then train of course but that costs more (2 more zones) & we wanted to try the West buses properly so did a 4 bus 2 hour trip back to Penrose. Worked pretty well if not slow with ~5mins between each transfer so was pretty tight but being a Sunday it actually worked (buses used were 112, 110, 195 then 009). The 009 is awful (not a West NN bus) if you go through Onehunga, but either side is OK. For our purposes the NN central bus Crosstown 7 will be far superior to this going via Mt Smart Rd & missing Onehunga interchange altogether. It will also will run consistent, early, late & more frequent (all day frequency of 15 mins). 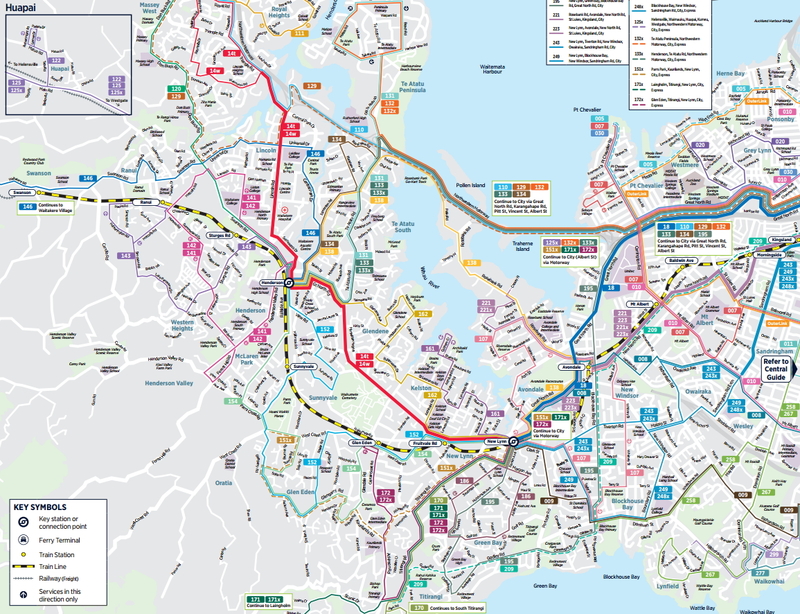 It would be interesting whether a service using the Waterview motorway would get any patronage if it ran all the way from Westgate to Onehunga but stopping off at Mt Roskill, a kind of flyer crosstown service. Seemed to be quite a few using the new Western services, you could actually see into the buses being not heavily tinted! Oh one more thing, yes the debacle over the bus stops at Westgate shows up with terrible positioning of the stops & having to cross the road to transfer with nearby roundabout. * correction – actually 3 more fare zones around the top from West to the Isthmus.